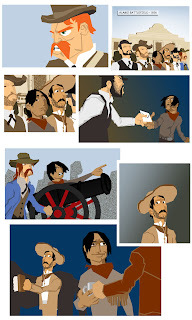 so now Permanent Residents moves on to the first vignette, which is built around a rivalry between two Tejano volunteer soldiers in the Texas revolution. this comic takes place at the historic Menger Hotel, across the street from the Alamo, so in 1836, the site was actually a battleground. it was fun to dive into the period elements of the story (although it made me nervous when i read the script!). Period fiction has never been something i took interest in as an artist, so it is actually kind of fun to try it! i wanted to try to draw this totally in photoshop without drawing on paper first. i found out that i really like drawing cowboys, which i did not expect! so this vignette should be fun! 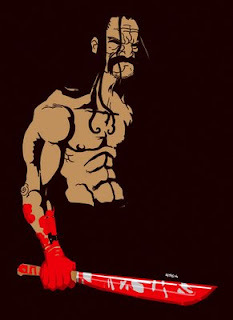 Machete by Samax Amen. brush pen, photoshop. click to enlarge. i've been keeping busy lately. besides working on the comic Permanent Residents for my client, i'm also writing, illustrating and quarterbacking the latest issue of my comics anthology/hip Hop culture magazine ghettoManga Quarterly, which is available for preorder now. the new issue will have the first installment in the series of illustrated articles Movies That Should Be Comics. the pic you see here is for that first article about Robert Rodriguez's Grindhouse spinoff/mock-trailer-turned-actual-upcoming-movie Machette, whose star Danny Trejo was so easy to draw that I was able to knock this out in one sitting. anyways, sorry i took so long between posts... i'll try to do better next time! 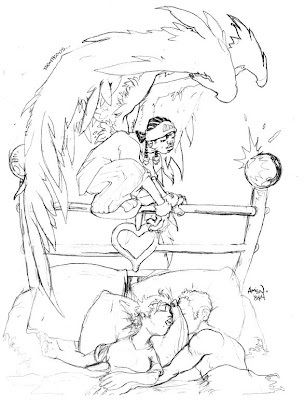 While You Were Sleeping pencil on paper by Samax (click to enlarge). anyways, hope ya'll like it! like all the babies i've ever been around, my daughter Marley loves music. 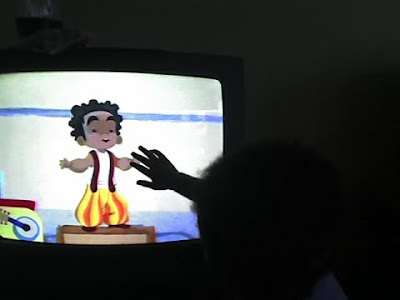 her favorite video right now is Papa Moco Jumbie which they play periodically on Noggin. not enough for me and my wife's tastes (watching this little brown boy praise his daddy's job makes us almost as giggly as it does Marley), so i went and found it on youTube (after recording it on the DVR, of course). Papa Moco Jumbie is about a little boy who wants to be just like his dad, a Moco Jumbie (one of those guys on stilts at Carnival). 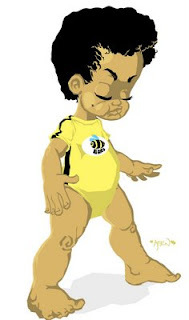 obviously, Marley has no knowledge of her race, culture or any of that... she just loves dancing and singing along! but i'm glad to be able to have her dance and sing to this! a pic of yours truly rockin' the live art on the roof of The Bone in dallas for the ArtLoveMagic/H4 Benefit Show. 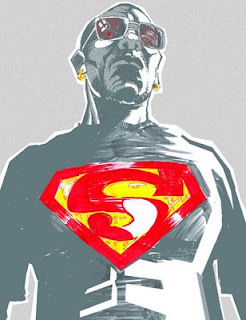 no, my boy Drew doesn't have a rap album, action movie, or graphic novel coming out... i gave his portrait its larger-than-life aura because Drew is a big-time Superman fan. he has a tattoo of the Man-of-Steel's iconic symbol on his back, a Superman chain he wears on his neck... he's got a Superman TIE, for pete's sake! you only have to talk to him on the phone once to know he does everything Godzilla BIG, so i made sure to bring that superhuman steelo to his portrait, ya dig? anyways, i drew (heh) this with watercolor brush pens and cranked it up a few notches with photoshop. let me know what ya'll think! 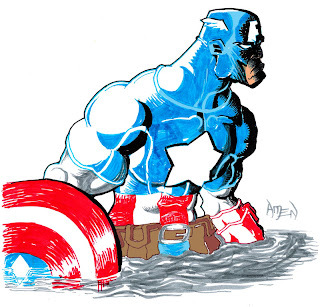 Captain America by samax. watercolor brush pens on computer paper.